Valentine’s Day is coming and, even during years when we’re single, it’s one of our very favorite holidays! There’s just something about celebrating love that we really enjoy, even though we do our best to do that every day. Being DIY and crafting enthusiasts, we also love Valentine’s Day because it’s such a great opportunity for getting creative. What’s the thing we like crafting the best near Valentine’s Day, you ask? 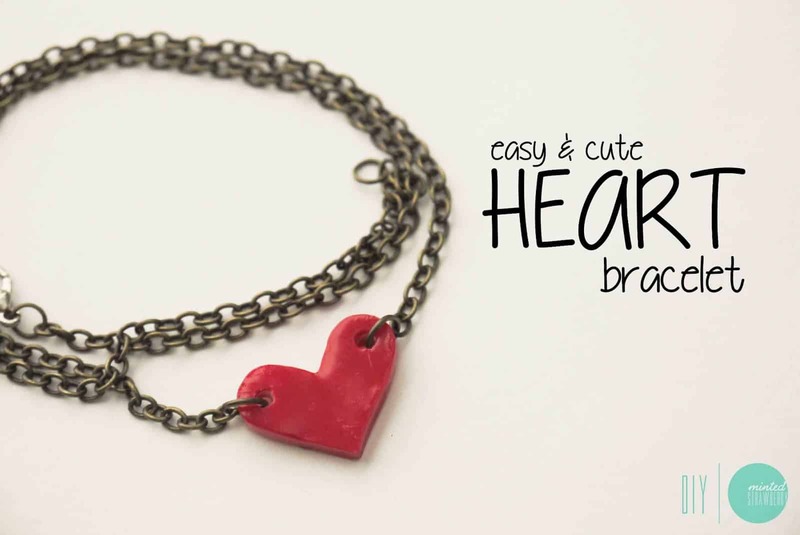 Well, there are literally countless options, but we’d have to say that making heart shaped jewelry is our favorite! The best part is that, depending on how specifically festive you make the piece, you can keep wearing whatever you make after since hearts are so cute any time of year. 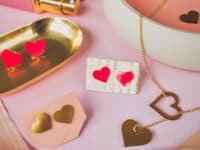 Just in case you love the idea of Valentine’s Day jewelry as much as we do, here are 15 adorable heart shaped accessories that you can make yourself! Is your first instinct when it comes to making heart shaped things to include as many hearts as you can because you just love the idea so much, but you’re actually pretty convinced that you should make something at least a little more subtle so you can wear it all year round? 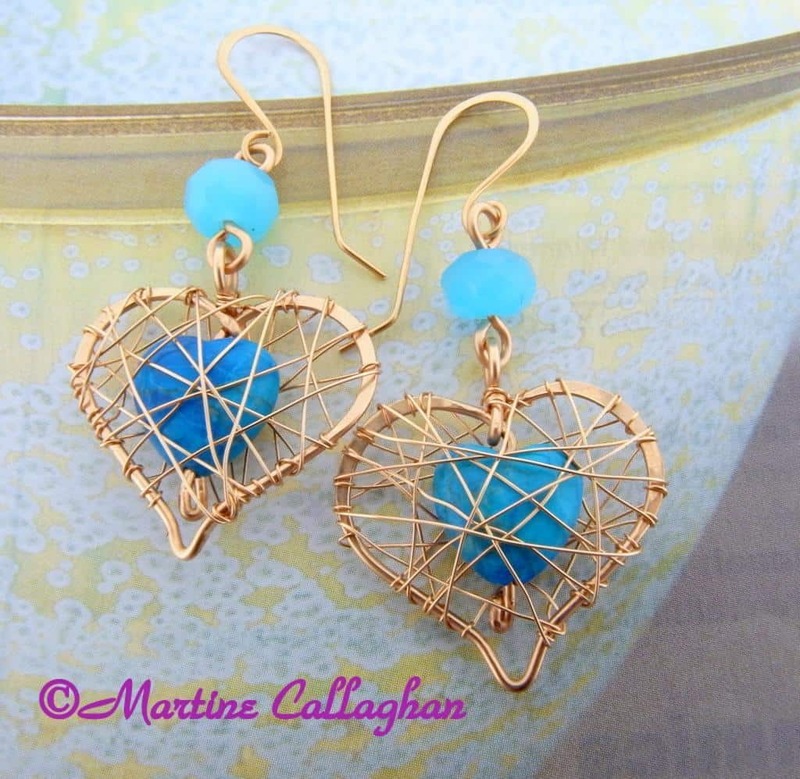 In that case, we think these awesome wire wrapped heart earrings with hearts on the inside too might be right up your alley! We love the way the contrasting colour shows through the gold wires. See how it was made on Craftsy. 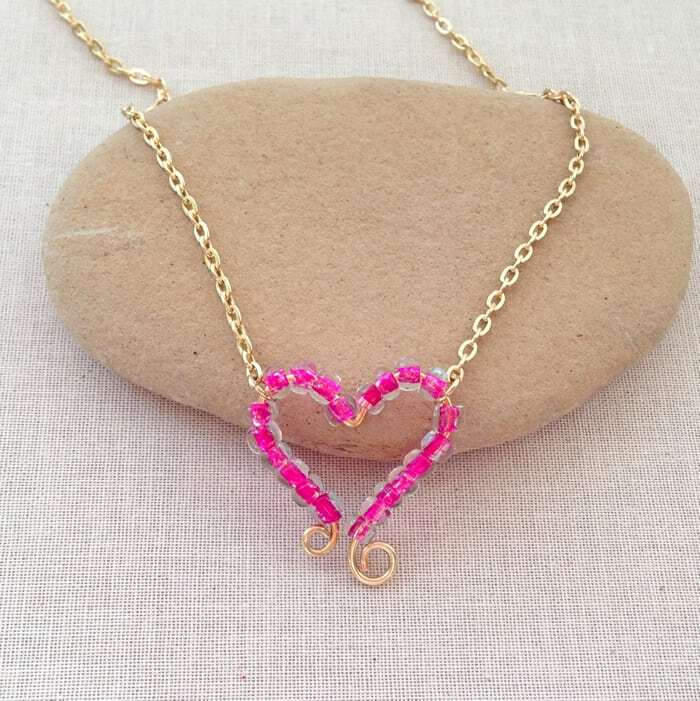 Lisa Yang Jewelry added a little pop of colour by stringing bright pink seed beads all along the heart before curling the ends up to keep them on. 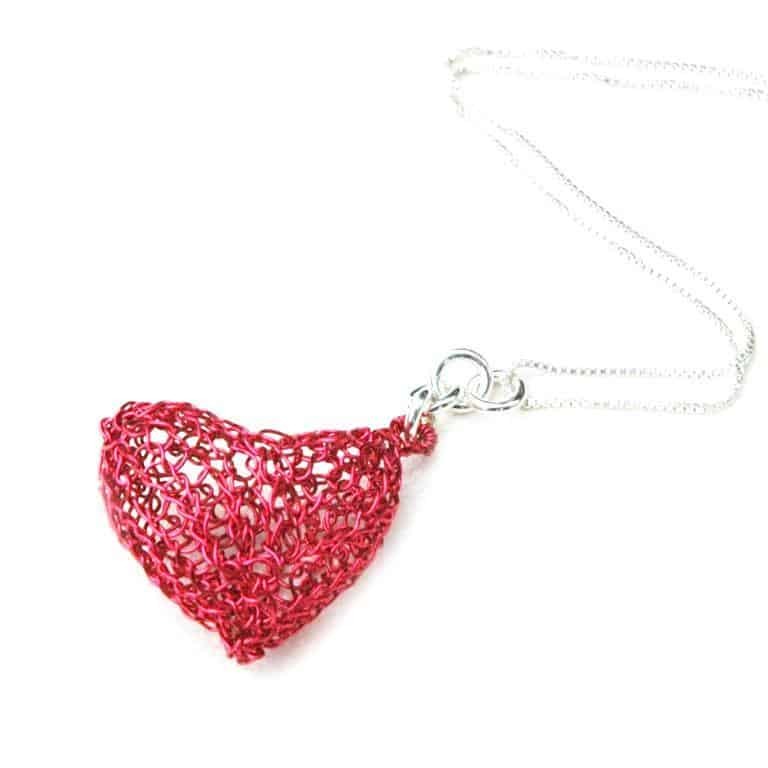 Did we really catch your attention with the idea of bending yourself a heart shaped necklace pendant but you don’t have any beads right now or you’re not sure you want to add a pop of colour after all? In that case, perhaps you’d prefer this simpler bent wire idea instead! We love the way Crafthubs added a sort of old fashioned effect to their wire by using a hammer to flatten the bent heart once it’s attached and in place. 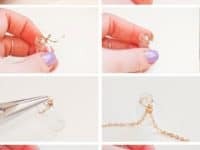 Are you actually quite into the idea of making yourself a heart shaped necklace that’s a little more explicitly Valentine’s Day themed than the ones we’ve shown you so far? 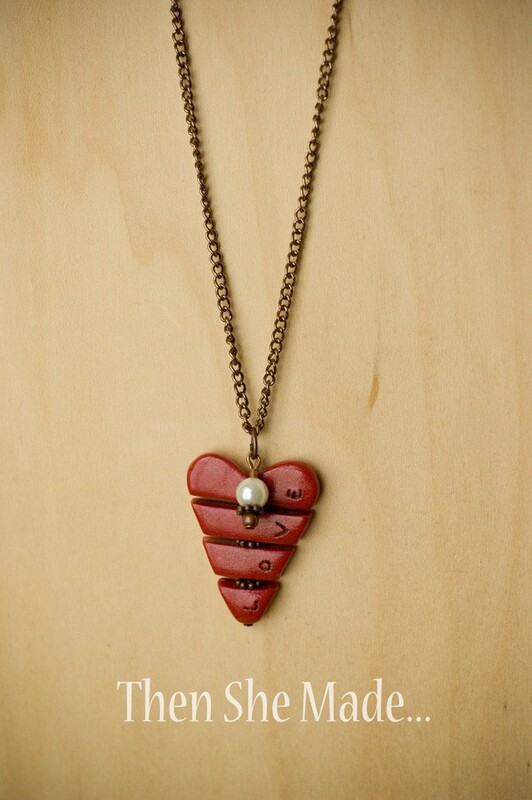 In that case, we definitely think you should take a look at this adorable clay necklace concept from Then She Made! They’ve created a pretty read heart from polymer clay and divided it into sections; four pieces for each of the letters in the word ‘love’! Link the pieces together with jewelry links and add a pearl for embellishment and voila. Just in case you’re still enthralled with the wire bending idea but none of the designs we’ve shown you so far have really grabbed your attention? Then here’s another alternative for you! It might not be classically heart shaped like the others, but we still love the connection it makes. 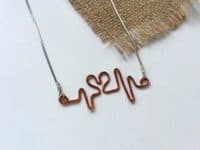 Craftbits guides you through the process of bending a length of red crafting wire to look like a pulse reading with a cute little heart in the middle. 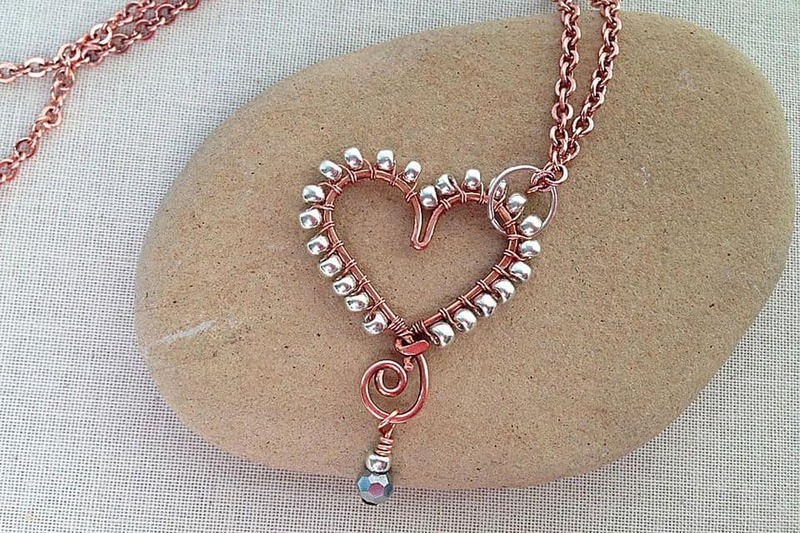 Were you pretty intrigued by the idea of framing your heart in seed beads but you’ve only got very thick and very thing crafting wire to work with? 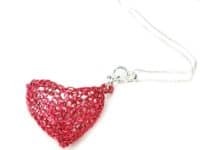 Well, in that case, you’ll probably have to use the thicket wire to make the heart since the thinner wire might not be strong enough to hold a base shape, but that could stop your seed beads from sliding on if it’s too thick. That’s why we were happy to find this alternative seed bead wrapping technique from The Spruce! 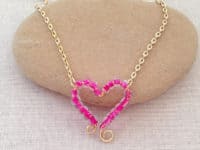 They suggest making your heart and then stringing the seed beads on thinner wire and spiralling it around its frame like a pretty border. Have you actually been scrolling through our ideas so far appreciating the way each one looks but thinking about how you’d rather make a design that’s a little more novelty, since it is a holiday and all? Then we absolutely think you should take a look at this adorable heart in a jar necklace pendant! Craftbnb shows you how to put one of your very own together in just a few surprisingly simple steps. No matter how old we get, candy hearts will always be one of the very best parts of Valentine’s Day in our opinion. Besides being sweet and yummy, they’re also just totally fun and kitschy looking in a way that nearly makes us want to wear them! We know, however, that making jewelry out of candy is risky since it melts if you come into contact with water. Imagine how excited we were, then, when we came across this funny little candy heart charm bracelet design by Nikki Teahouse! 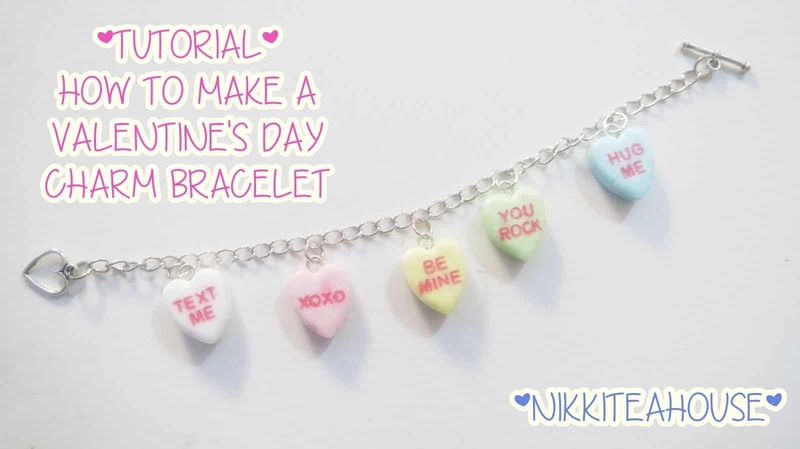 They show you how to make clay versions of your favourite quote hearts, as well as how to attach them all along a simple chain bracelet. Are you impressed with what you’ve seen so far but you’re also quite new to the world of crafting and DIY so you’re hoping to keep things pretty simple? Then clay, paint, and a long, simple chain are just about all you need! Check out how Minted Strawberry created a heart shape, painted it red, and attached it along a length of chain that will wrap several times around your wrist for a cute layered effect. 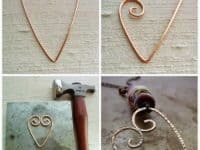 Okay, we know we’ve talked quite a lot about wire wrapping techniques because they’re so trendy in jewelry making right now, but simple wrapping and bending aren’t the only way to make yourself heart shaped wire jewelry for Valentine’s Day! Here’s an alternative that’s so cool our hands are practically itching to try it. 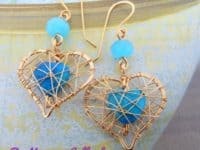 Craftsy guides you through the process of crocheting a heart shape with malleable crafting wire. The technique is much the same as the regular yarn crochet you’re used to, but with a stiffer gauge that will take a bit of getting used to. Once you’ve got it, though, wire crochet can be almost addicting! Were you pretty enamoured with the heart in a jar necklace pendant we showed you earlier on our list but you couldn’t help feeling like it would look even more bright and fun if there was more inside the jar than just a little, single heart? In that case, we have a feeling this awesome sprinkle jar idea outlined on Sprinkle Some Fun might be a little more your style! They show you how to quite simply fill a cute miniature crafting jar with rainbow sprinkles in whatever shapes and colours you choose! 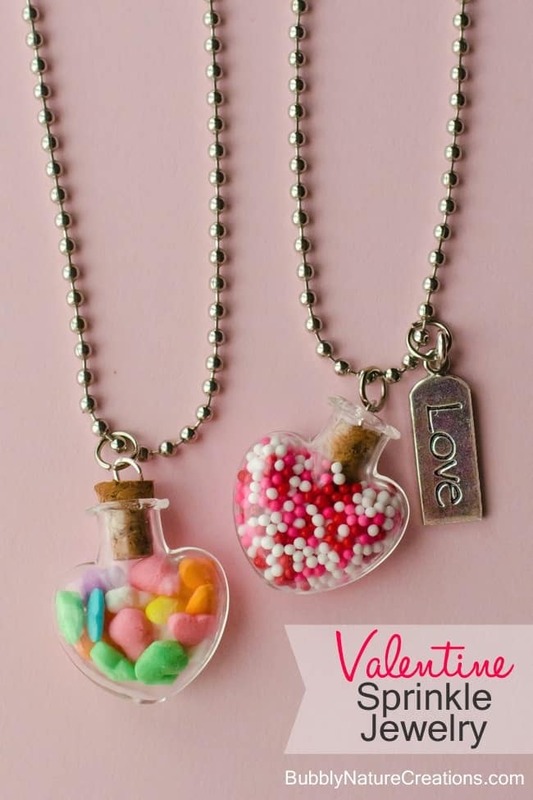 We love the idea of filling a heart shaped jar with matching heart shaped sprinkles. Have you been scrolling through our list appreciating what you’ve seen but thinking about how your personal style has always been a little more flashy and statement-making? Well, if you’re going to dress uniquely and craft for a holiday theme, you might as well really go all out! We’re completely in love with this jumbo clay heart pendant idea from The Year of Living Fabulously because it’s so fantastically love themed but it’s also so bold that wearing it any time will be just as impressive. Check out their tutorial to find out how they both moulded and embellished theirs! Are you still thinking about the heart shaped earrings we showed you earlier but you’ve just never been a fan of dangly styles because you find they get caught in your hair? Then maybe some simple studs would be more your style! We love the way Lia Griffith made these ones in red and gold using shrink film. You could play with all kinds of colours and sized to make as many pairs of cheerful heart studs as you please! 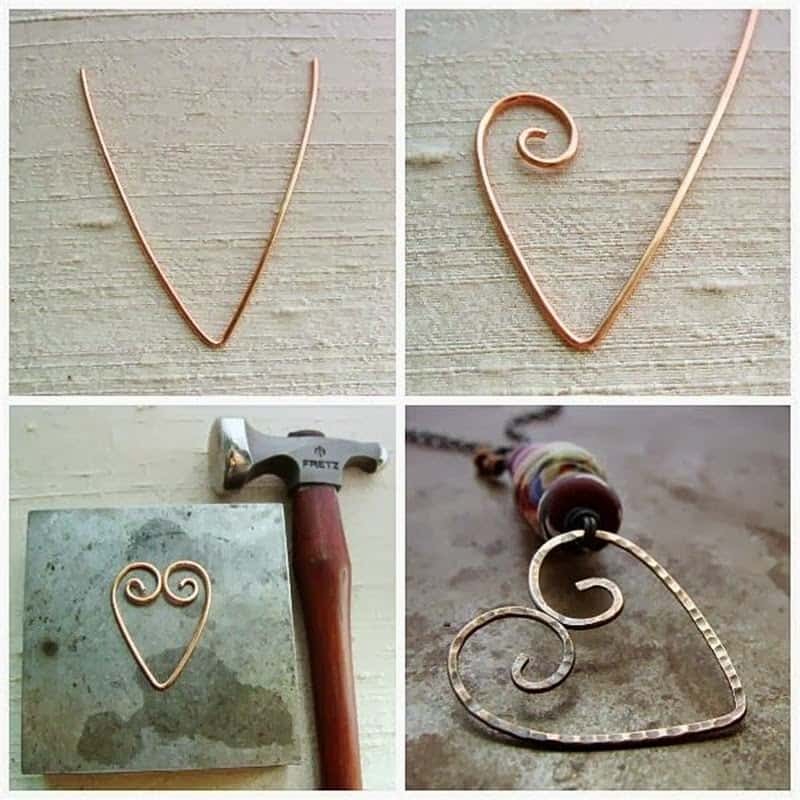 Have you actually already made yourself several wire bending projects and now you’re interested in making something heart shaped for Valentine’s Day but you don’t really have very much left to work with? Well, hold off on worrying for now because you’re not out of luck just yet! 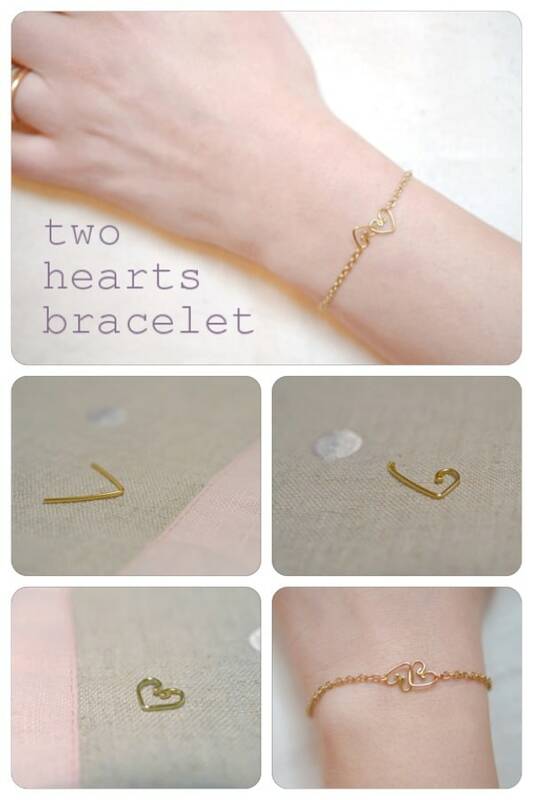 Check out the simple, delicate way that Craftbnb bent two little golden hearts and intertwined them in the centre of a simple chain bracelet for a very cute, delicate effect. This one would make a great gift for someone you loved! 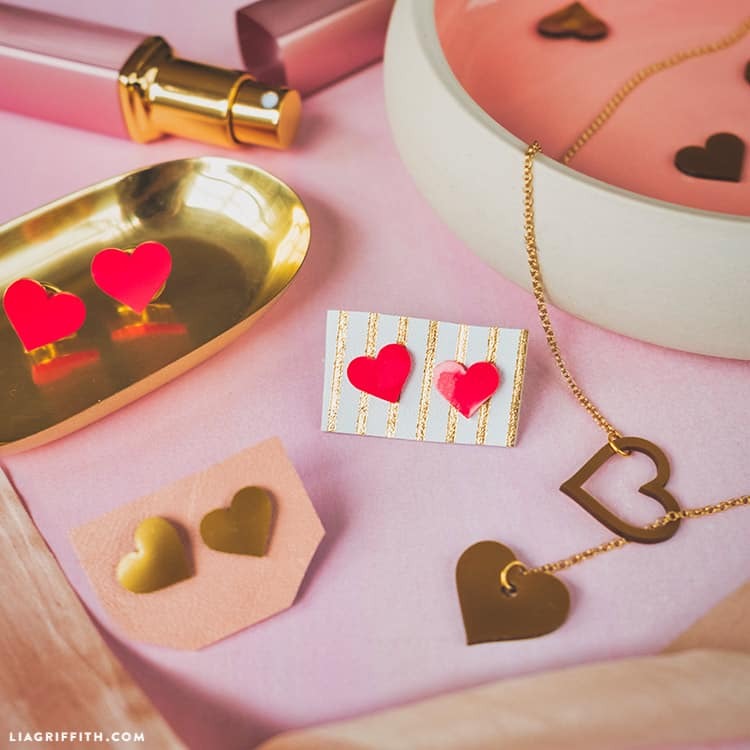 Have you actually been scrolling through our list hoping to come across a Valentine’s Day heart design that’s a little less bright and cheerful, not because you don’t love the holiday but rather because your personal style has always been a little more edgy? In that case, we think perhaps we’ve found just the unique design for you! 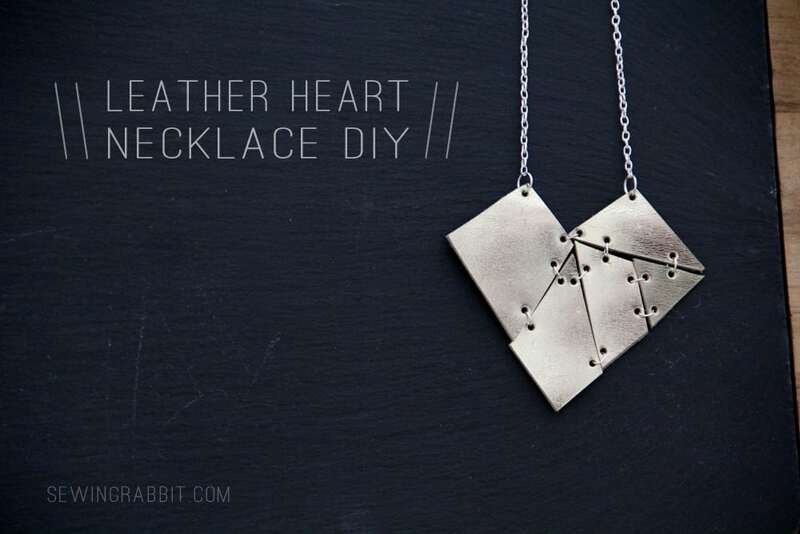 Check out how Sewing Rabbit used geometrically cut pieces of metallic leather to create a pieced together heart, holding the pieces in place with jewelry links so they fit together like a smooth sided puzzle while you wear the finished necklace. 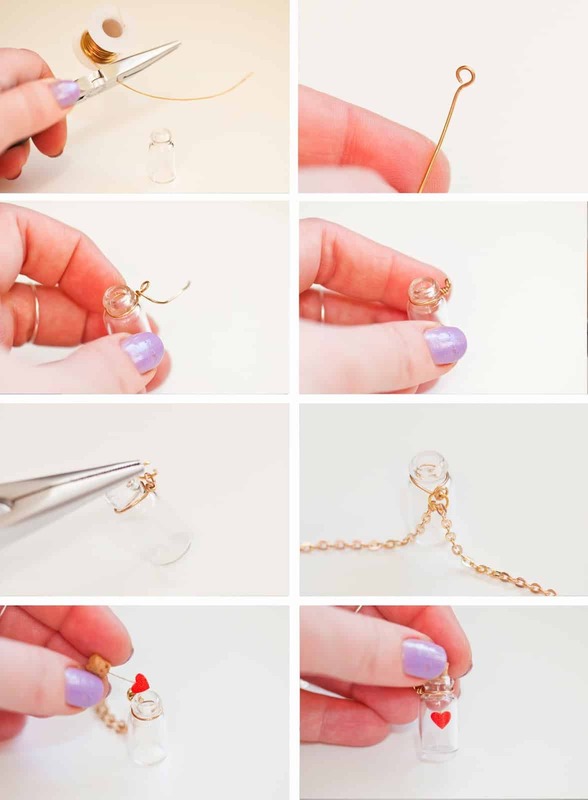 The post Cute DIY Heart Shaped Jewelry for Valentine’s Day appeared first on WonderfulDIY.